Least common multiple - Least common meultiple is a multiple of two or three ( actually four, five and so on was not anything ) numbers are the same and the smallest. As so of the two numbers 2 and 3. Least common multiple form 2 and 3 is 6. And number 6 multiples 2 and 3. Because number 6 multiples 2 and 3 so number 6 can be divided by 3 and 2. There are many ways to find Leas common multiple. 1. The first way is by adding two numbers with itself continuosly. From the example several multiples from 2 and 3 is same. The same numbers is 6 and 12. But in least common multiple just smallest number called least common multiple. But with this way we will use a long time. 2. The second way is we will use the factor tree. 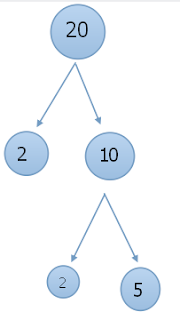 What is factor tree ? factor tree is like this. 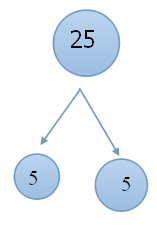 With factor tree we can find the factor with easy. Because that we will use this. Factor from 20 and 25. From two factor of 20 and 25, there are the same number is 5. From both the number five we can look 5 from 20 and 52 from 25. Because there are two same numbers we will take the largest. From two 5 number the largest is 52. Then factor from 20 are 22 we will take this for later. So the two number we take is 52 and 22. From the number we take we will multipliying the two number. From two factor above we can look the same number. The same number is 100 and 200 but least common cultiple is a multiple of two or three numbers are the same and the smallest. So the smallest is 100. So from the proving above we can conclude that use first way and second way the result is same. And with use the second way is an effective way and does not take a much time.